Providing you the best range of akm washdown motors and akm washdown motor with effective & timely delivery. With the Gear Motor AKM62K-BK17 in the Washdown Food version is made for most transport and rotation applications in the food, beverage and packaging industries. This is based on combining an AKM servo motor with highly efficient gearheads. The main advantages of the ready-to-install drive units with a consistent, hygienic design include: significantly reduced cleaning times due to smooth and water-repellant surfaces, low energy costs thanks to the highly efficient motor/gearhead combinations, as well as simplified design options for machines implemented by means of space-saving assembly without additional stainless steel casings. 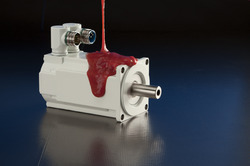 Thanks to the use of FDA-compliant materials and the specially rounded housing design, motor/gearhead combinations from Kollmorgen meet the highest hygiene standards and reduce the risk of product contaminations and recall campaigns. Looking for “AKM Washdown Motors”?